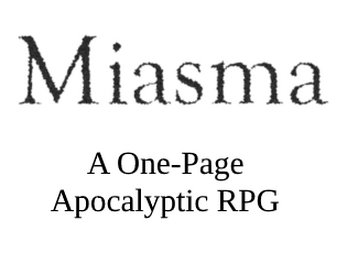 Miasma is a one page apocalyptic tabletop RPG about a world only a few years in the future when a magical fog begins to cover the land, transforming the world and the people within into something unrecognizable. Though its themes are targeted towards ABDL and transformation enthusiasts, it's not cluttered with fetishy content and can very easily be played by anyone regardless of interest. The system uses a d20, a d4, a d6, and a d8 at most. It is not a "d20" system; the d20 is used for skill/stat checks only while the other dice are used for combat (though you'll likely only need one or two of them). By paying the $2.99 recommended price Now for free, you'll get access to an additional three pages of content, including additional information and adventure prompts about the world, examples of magic and items, examples of gameplay, guidelines on creating macro and micro characters, and more. If you've looked through the bonus content and can't find an answer to a question or need more information on something, let me know in the comments and I'll see if I can add it!